Maddy Patti is a young girl who goes to her grandfather's farm every summer to spend time with him and all of his animals. Maddy's grandfather, Pop-Pop, is a retired country doctor. During her visit to the farm, her friend Gideon Green tells her he has a disease called diabetes. 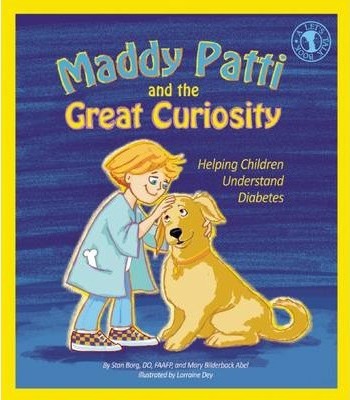 Since Maddy Patti has the gift of being able to communicate with animals, they help her understand diabetes. Pop-Pop discusses diabetes with Gideon and explains that with proper care and a healthy diet Gideon can play, work, and have fun just like any other child. When one of Pop-Pop's goats gets into trouble, Gideon saves the day. Children who have friends suffering from diabetes, or who themselves confront the disease, learn more about their own and other's symptoms and problems, treatments, and prospering despite living with the disease. Stan W. Borg, D.O., F.A.A.F.P. is a family physician and nationally recognized healthcare executive. He holds degrees from Whitworth University in Spokane, WA, and Western University in Pomona, CA. He is a fellow of the American Academy of Family Physicians and lives in Chicago. Mary Bilderback Abel has been a professional writer for more than 40 years. She is the recipient of multiple writing awards, including the Sigma Delta Chi Mark of Excellence Award in Journalism. She holds a B.A. in journalism from Ohio State University and lives in Newark, OH. Lorraine Dey is an illustrator with a broad range of artistic styles. From the fresh, whimsical and unique colorful characters in her children's and textile illustrations, to the realistic scenes, animals, and product art produced in great detail for the advertising & publishing industries. She lives in Manasquan, NJ.